When we look at how God deals with the sins of man He says He will judge each man according to both his faith as well his works: "But if a man is just and does what it lawful and right; if he has not eaten on the mountains, nor lifted up his eyes to the idols of the house of Israel, nor defiled his neighbor's wife...if he has walked in My statutes and kept My judgments faithfully--He is just; he shall surely live!' says the Lord God'" (Ezekiel 18:5-9). God is the just and faithful One. His judgment is pure. As sure as the Lord God lives His answer is the one that matters most. What He's saying within this text of Ezekiel 18 is that the faith of a man and his actions are what cleanses and purifies him in the sight of God, or else declares him unfit for God's kingdom! So, when God says, "If [this man] bears a son who is a robber or a [murderer], who does any of these things and does none of those duties, but eats on the mountains or defiles his neighbor's wife; [by] oppressing the poor and needy, robbed by violence, nor restoring the pledge, lifts his eyes to idols...he shall not live! If he has done these abominations, he shall surely die; his blood shall be upon him" (Ezekiel 18:10-13, New King James). God is saying throughout Ezekiel 18 that the soul that sins shall die, but at the same time He says, "But if a wicked man turns from all his sins which he has committed, keeps all My statutes, and does what is lawful and right, he shall surely live; he shall not die" (Ezekiel 18:21). Can you name one person, alive or dead who has been able to keep his hand from bloodshed, who has not violated the commands of God, who has not sinned in the least part? I know I can. But can you? God says this a couple verses down from verse twenty-one: "Do I have any pleasure at all that the wicked should die? And not that he should turn from his ways and live?" It gives us insight into the mind of God to see that He doesn't enjoy executing judgment besides that of saying, "Well done good and faithful servant! You have been faithful with a few things; I will put you in charge of many things. Enter into the joy of your master!" (Matthew 25:23, Berean Study). I see the heart of God that seeks out those to promote, to allow a person the right to live fully, and in His presence, being able to be more responsible with the things of God as He allows this person to do. But how do we get there? If we follow God's logic within this page of scripture of Ezekiel 18, we see that God's desire is to get man to turn from his wicked ways and to turn to the sake of righteousness. But how is it we do that? How can we turn from our old ways and become this righteous creature God calls out, "Son! Child of mine, you are found to be alive!"? Friend, it is through Jesus Christ, who dies while He was righteous, not having sinned once, not once lifting His eyes to worshiping any other than the Father alone, that we are made righteous before God the Father. It is through the redemptive work of Him who came to give the blind man his sight, who healed the lame man giving him back strength to walk and run and leap for joy. It is by the hands of Jesus that bind up the broken heart of those who are able to cry out in joy, "Hosanna to the Son of David! Blessed is he who comes in the name of the Lord! Hosanna in the highest heaven!" (Matthew 21:9). We have this gracious righteousness staring us in the face by none other than the face of Jesus Christ, the man who conquered the grave, death and sin. He alone declares us righteous as He is righteous. The death He went through we go through at baptism, so that once we come up from those waters we have life everlasting with Him, just as the Father resurrected Him in power and glory! Wouldn't you desire nothing more than to hear the Father call out to you, "My son! My child! I have wept and called for you and here you are! You now stand before me and you can therefore enter into My rest!" Yes, God desires more so to give you life and for you to have it everlasting. So, how do you make this transaction and put off the works of the flesh? It comes down to having heard the gospel of Jesus Christ. You make Him yours. He gently knocks at the door of your heart, asking sweetly and gently to allow Him the right to enter into your heart. He will never make you feel guilty over a simple mistake. Yes, He will show you the way in which you sinned, but it's for a moment and He shows you such immeasurable love that you no longer desire to keep on in sin. You will either love the Lord Jesus with all your heart, your soul and your mind, or you will love your sin all the more. But I ask you this: is it worth eternal hell and damnation to be separated from the love of Christ Jesus? If you have prayed and asked the Lord Jesus into your heart just now, rejoice and be glad that you are now a child of God. you may still sin, but you will look at it in such a way that you'll be more like, "I wish I never did that! Wretched soul am I! Who will save me from this death? Of course, it is through Jesus. Lord, have mercy on me, a sinner!" And He will forgive you because you confessed you have sinned. Beloved, you stand here now because you are that tired of the sinful life. You're not simply reading these words and scoffing, saying, "Jesus is Lord!?" And if you are, the Lord rebuke you! Rather, you read this in and with a broken heart desiring to be made alive in Christ Jesus to do the Father's will in your life. 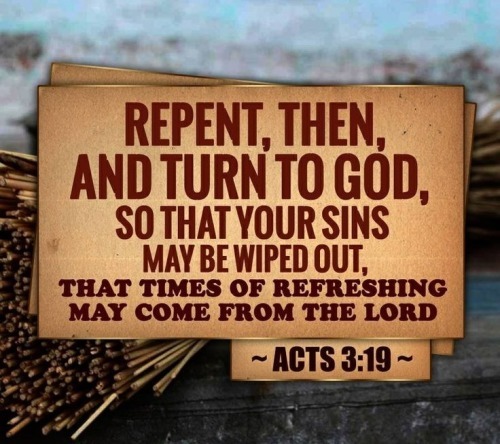 I pray this has helped you see God doesn't desire any man, woman, or child to perish in their sins but to call each and every one of us to "turn and live" as He tells us in Ezekiel 18. In the name of Jesus Christ I pray over you. Amen.